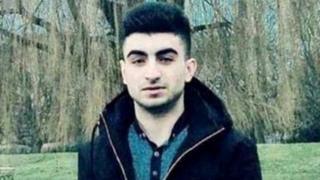 Six young men from south London have been jailed for an attack on a Kurdish-Iranian asylum seeker. Rekar Ahmed, 17, suffered a fractured spine and a bleed to the brain after being beaten up in Croydon last year and spent days in an induced coma. Over two trials, five defendants, aged between 18 and 21, were found guilty of two counts of violent disorder. All were sentenced at Croydon Crown Court, along with James Neves, 23, who admitted one count of violent disorder. Mr Ahmed also suffered facial fractures when he and his friends were attacked near The Goat pub on Broom Road, in Shirley, Croydon. Following the attack, Mr Ahmed was treated King's College Hospital - and £59,000 was raised online for him. The Met Police said about 20 people were involved in the assault on 31 March. A total of 17 were arrested, of whom 14 were subsequently charged. On 9 November, Kurt Killick, George Walder and Lliam Neylon were all convicted of two counts of violent disorder. The second trial finished on 1 February with George Jeffrey and Ben Harman both being found guilty of two counts of violent disorder. Mitigation for the six men was heard at Croydon Crown Court during a sentencing hearing on March 2. During a victim impact statement Mr Ahmed told the court he has since tried to take his own life, that he has nightmares and flashbacks and does not sleep properly. At the sentencing Walder, of Myrtle Road; Neylon, of Ferris Avenue; Harman, of Akabusi Close and Jeffrey, of Uvedale Close were each jailed for 50 months. Killick, of Court Wood Lane, was sentenced to 40 months in prison and Neves, of Eastwell Close, Beckenham, was told to serve 28 months behind bars. All six men were each told to pay a £170 victim surcharge.